All transactions are safe and secure with a reliable history in online purchasing behind each of our associates. Buy the Iron Man Avengers t-shirt to own Iron Man clothing and merchandise. This inked style Avengers Iron Man Marvel t-shirt features an image of the superhero on the front. From his Marvel comic book roots to his big screen battles, this tee is perfect to wear as you experience any of his action-packed adventures. You can also wear it as you fine tune your repulsory units with the help of your robot assistant JARVIS, or put it on to play with your Iron Man action figures and toys collection. 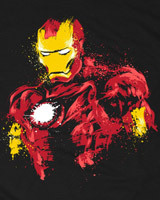 In addition to the Iron Man Avengers tee above, browse the Iron Man Clothing Gallery for more apparel like men's and women's clothes, kids shirts or hoodies.